Classic Shakespeare put to modern times. Well, not modern times exactly. From the looks of it, I would guess this film is supposed to take place circa 1940 in a very Fascist England. I’ve seen this film once before, shortly after it came out. At that time, I had no idea who Ian Mckellen was, or his history of playing the very best Shakespearean characters. Of course, now millions upon millions of people worldwide know Ian McKellen as both Magneto in the now famous X-Men and, more recently, as Gandalf in the Lord of the Rings trilogy. 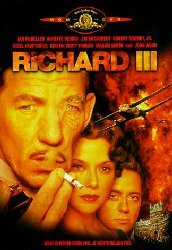 As the title suggests, in Richard III, Ian McKellen plays the most diabolical, yet intriguing (in my opinion) monarch in English history. I’ve read Richard III a couple of times. I’ve even actually been to the tower of London where we were all regaled with stories of the ill fated two princes Richard III may have had murdered. I believe Mr. McKellen nailed this performance. Even those of you not interested in the sordid past of British Monarchy will have to admire what he does with this character. Unfortunately, the movie is sidetracked somewhat by two other actors. Robert Downey Jr. and Annette Bening, two brilliant actors, are probably miscast is this film. Of course, this all may be a matter of taste. It just seemed to me that Downey’s character was both superfluous and obnoxious. Bening’s character, the murdered king’s wife, should have made me care more about the fate of her family. Instead, her performance was somewhat flat. However, the cast was nicely rounded out by Maggie Smith, playing the role of the murdered king’s mother. All and all, a pretty darned good film. It’s even better if you enjoy Shakespeare.